knightendo77 wrote: Looks like a lovely conversion. And the wedding photos are awesome, will be showing these and the Vegas wedding ones to my girlfriend lol. I notice you have removable Greek licence plates so you're obviously using the car legally on the roads, so was just wondering if you will be adding a round steering wheel or keeping KITT's original? i will keep kitt's original wheel ofcourse!i am kind use to it!i love the feeling of that wheel when you drive!the only problem is when i go the car to the technical control test every 2 years...i have 2 solutions..or to change it for the round one..or to....."pay" something extra so the guy who checks the car..got suddenly a little bit blind and never notice the kitt gulwing wheel!!hahahahaha! !the license plates are original license plate so the car is legal!also most of the cops here almost know me cause it is the only kitt in athens and the only kitt in the whole greece!so when they saw me somewhere they just wave their hands to say hello!hahahahaha!! 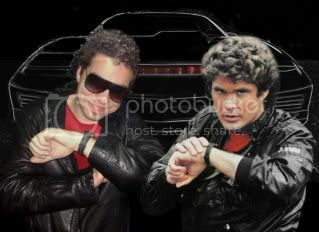 stelios_z28 wrote: i will keep kitt's original wheel ofcourse!i am kind use to it!i love the feeling of that wheel when you drive!the only problem is when i go the car to the technical control test every 2 years...i have 2 solutions..or to change it for the round one..or to....."pay" something extra so the guy who checks the car..got suddenly a little bit blind and never notice the kitt gulwing wheel!!hahahahaha! !the license plates are original license plate so the car is legal!also most of the cops here almost know me cause it is the only kitt in athens and the only kitt in the whole greece!so when they saw me somewhere they just wave their hands to say hello!hahahahaha!! Lol, that's a brilliant story So I take it it's not illegal to be seen driving around with the gullwing steering wheel over there then? I know here in the UK it is, and so you'd have to have a round wheel to interchange with KITT's. FOR A LITTLE RIDE WITH SOME FRIENDS THIS SUNDAY...ENJOY!! 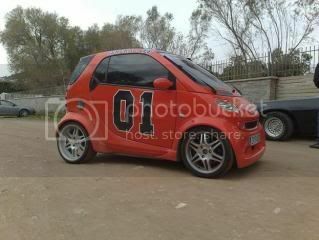 Wow the general Lee really let himself go. 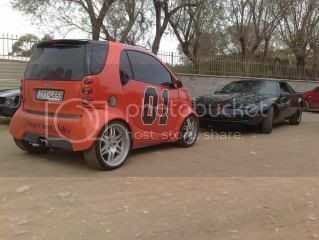 Sue wrote: Wow the general Lee really let himself go. take a look of mini general lee from another view and another photo of me playin with david in photoshop...hahahahahaha!!enjoy! I liked their pictures a lot, it is spectacular! 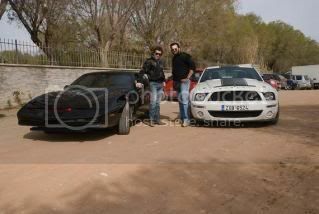 It is liked the car also a lot KITT and the General Lee. thanks man!a lot pics to come yet! !i'll keep you posted!! thanks a lot mate! !i really apreciate it!more photos will come in the near future!keep posted!! it is a supersnake indeed! !it is an excellent car in many ways! !ford really did it this time!! i will have in about a week cause he put this car in his other house far from here!i will go there next week!so i will take pictures for you to see it! hey guys if anyone of you ever wanna come to visit athens-greece..please let me know! !it will be my plessure to come and pick him up with kitt from the airport and have some pictures with another member of this forum! !